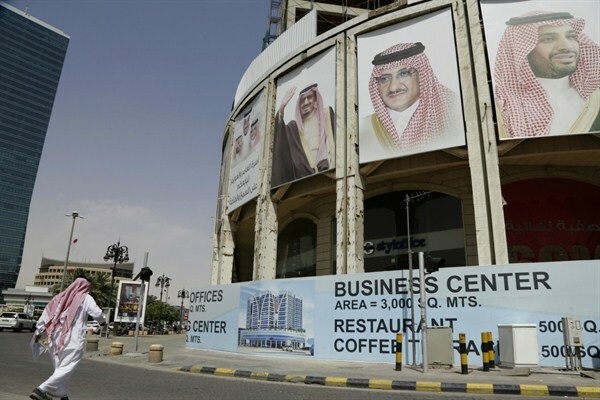 Images of Saudi leaders on a building under construction, Riyadh, Saudi Arabia, April 19, 2016 (AP photo by Hasan Jamali). The emergence of a brash and little-known 31-year-old as the public face of a dynamic new style of leadership in Saudi Arabia has caught international attention over the past two years. Deputy Crown Prince Mohammed bin Salman Al Saud, whose rise began in 2015, has promoted his so-called Saudi Vision 2030 initiative as an instrument of economic transformation in an era of plummeting oil prices. Against the backdrop of emergency spending cuts in 2015 that stove off financial ruin, the project aims to balance the Saudi budget by 2020, wean the country off of energy subsidies, and reduce the role of the state in the economy. While it is too early to tell if Saudi Vision 2030 will succeed or fail, the prospect of rapid and sustained change is a significant departure from business as usual in a country far more accustomed to cautious and incremental change.